Information About Freemasonry. Links to Masonic Websites. Gavel and Staff Lodge. Here you will find links to other Masonic websites which we hope will be of use. 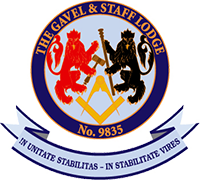 We do not guarantee that websites accessed via links on this page are either Masonic in nature or have been approved or endorsed by the United Grand Lodge of England. We specifically do not warrant that any other websites accessible from their pages are recognised by, or have the approval of, the United Grand Lodge of England.